It’s snack time once again, foodie fans! 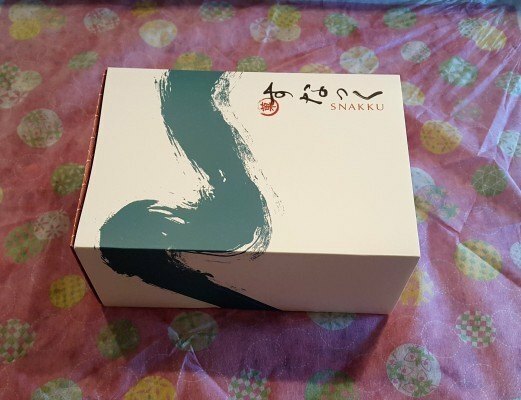 I got the privilege of sampling yet another Snakku subscription box. 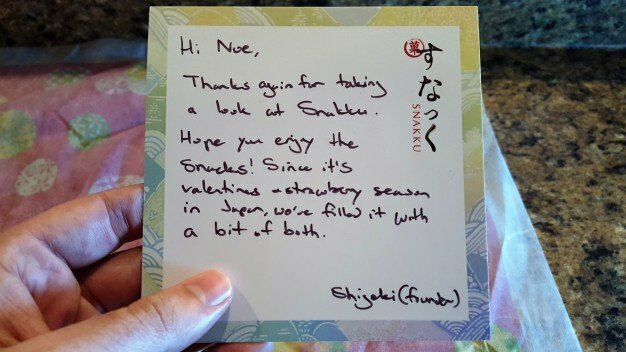 If you missed TVGB’s first taste of Snakku – a new Japanese snack subscription service that boasts more authentic, higher quality treats shipped direct from the land of the rising sun – please check it out here. Now, let’s dig into our latest delicious delivery! 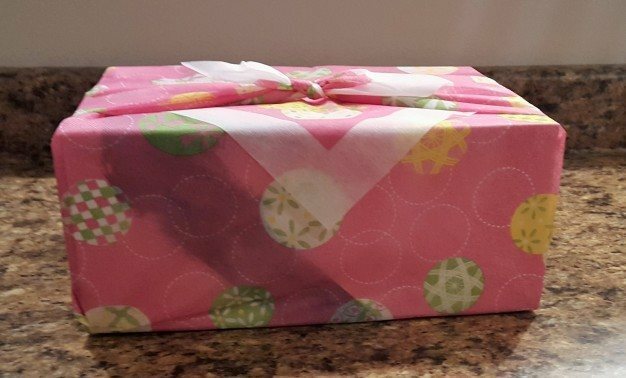 I got my beautifully wrapped Snakku box in the mail! I unwrapped it. Excitement building. 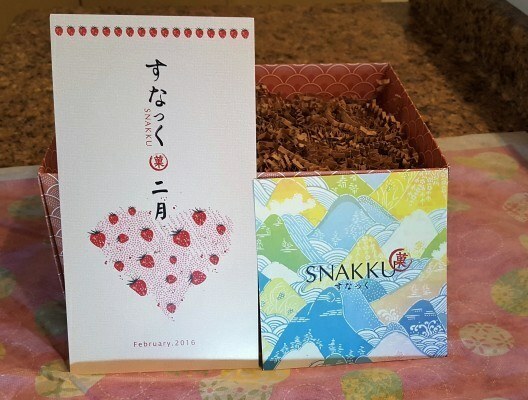 Snakku is a monthly subscription service offering authentic Japanese snacks that are only available in Japan. 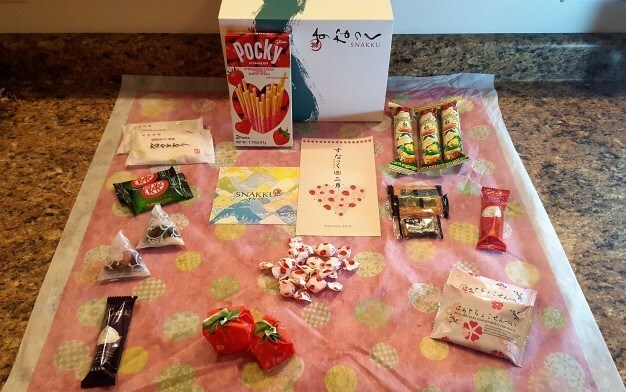 For $38.95 per month, you get a box packed with 10–15 hand-picked treats in authentic Japanese-style packaging. 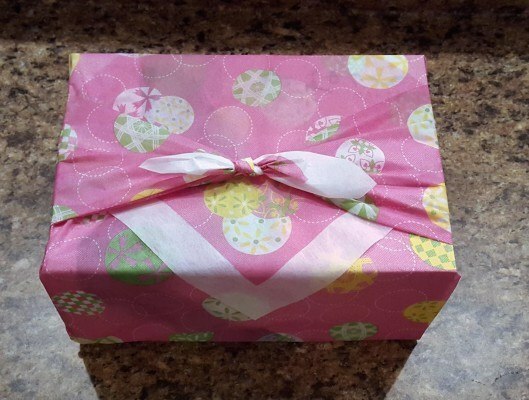 If you spring for a 3 or 6 month plan, you not only save some scratch, but your first box will come wrapped in a furoshiki, a traditional Japanese wrapping cloth. Sliding off the lid revealed two pieces of reading materials I immediately recognized from my last Snakku review. 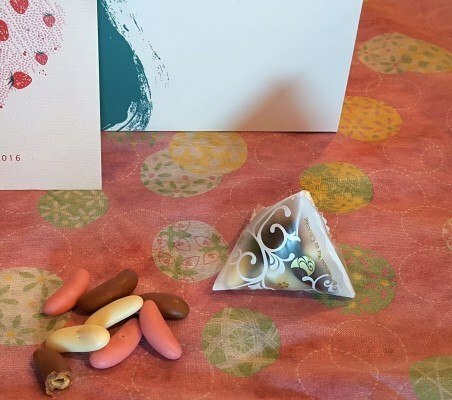 The first card describe’s the box theme for the month, where the snacks come from and details for each. As with the last Snakku box, it didn’t disappoint in terms quantity. The box comes fully loaded. I really liked the Arare. They tasted sweet and salty, like chocolate pretzels. These things were delicious. Perfect size, flavorful and had the perfect amount of crunch. My favorite was strawberry. These are a little hard describe but were one of my favorite items in this month’s box so I’m going to try my best. They had a soft, velvety texture on the outside and it felt very luxurious to bite in to it. Very fun to eat due to its almost sponge-like body and held a pleasing strawberry taste within. 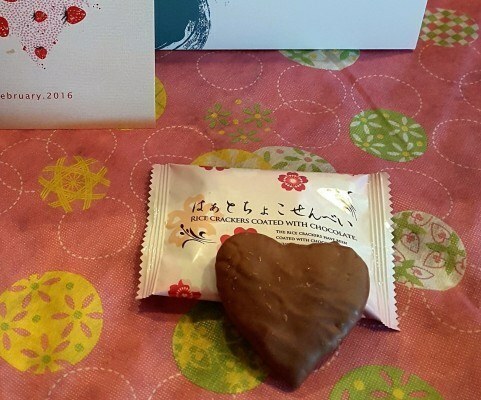 The Chocolate Senbei is one of the few items I got in my box I did not enjoy. The cracker tasted very dry and did not have a ton of flavor. The chocolate was good but began to melt in my hand after only a few seconds of holding it. So great concept but poor execution in my opinion. These crepe crackers are extremely beautiful. They really do have gold flecks on them. You can even see a few them in the picture above. Additionally, the ginger emulsion looks like a layer of snow coating the cracker. 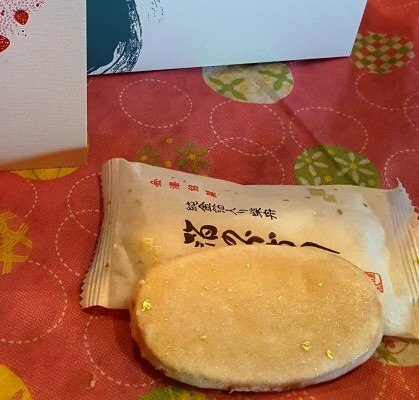 Unfortunately, this review is mainly about taste and the Gold Okaki were very hard to eat (literally). You really had to bite down to break a piece of it off. And I personally was not a fan of the ginger taste. It was a little overpowering for my pallet but imagine fans of ginger would enjoy it just fine. I have always loved Pocky. 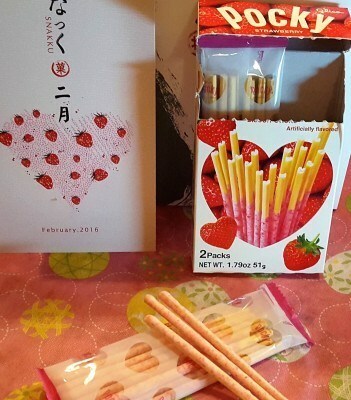 If you have never tried Pocky, you’re missing out. They are icing covered biscuit sticks. Fun to eat and very tasty. These in particular had a delicious strawberry coating on them and the biscuit sticks were heart shaped. How awesome is that! These KitKats were probably the best thing I put in my mouth out of this box. 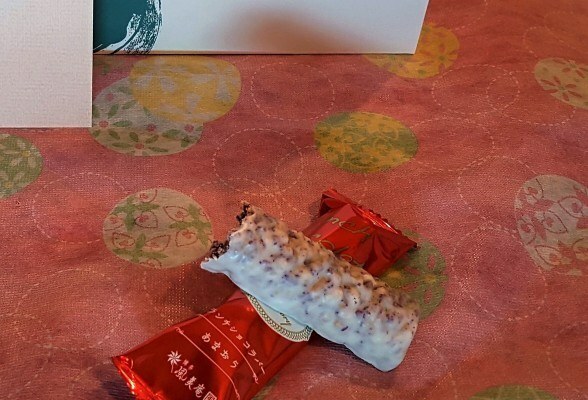 Who would have thought chocolate, wafer bar and green tea would pair so well together!? I loved these things. I wish I could find them in the US. 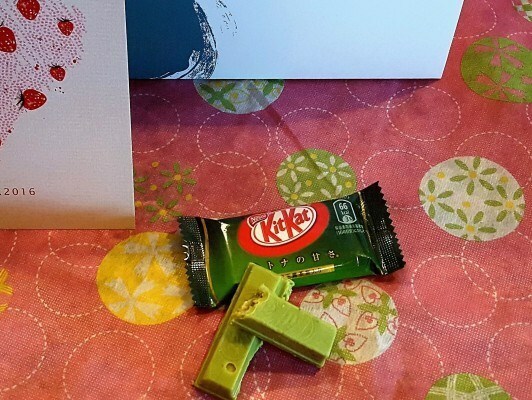 So if you love the taste of green tea and enjoy KitKats, then this Japanese treat is made for you! It’s even a fun green color! One of my least favorite products in this box, these rice crackers are hard and crunchy. 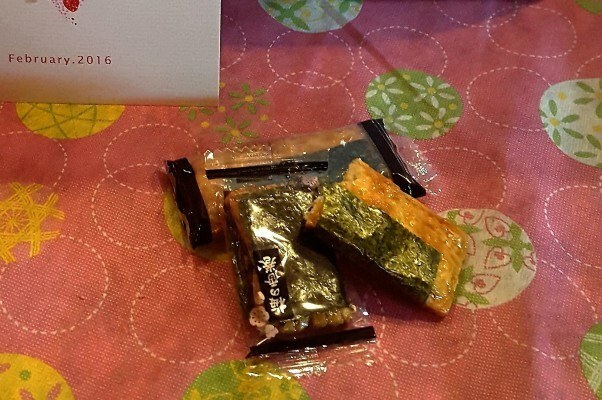 The soy seaweed flavored one was very savory but not in a good way. The seaweed taste overtook the cracker. The plum had a much more mild flavor and was a bit more enjoyable. The cracker was still a pain to bite in to. These things were…interesting. They tasted VERY strongly of corn, were a tad sweet but were light and airy, like a cheeto. If you could make a cheeto out of corn bread that is…it was still good though! 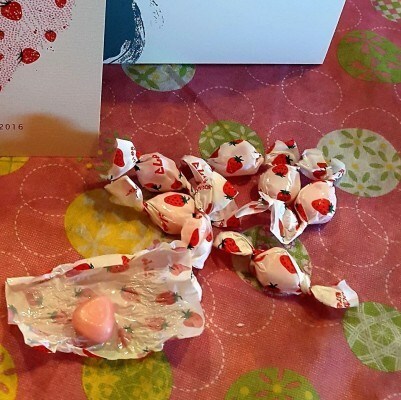 These milk candies tasted just like a strawberry cream saver. They are very sweet and made the perfect treat when I needed a sugar boost. The box came with plenty of them too! I approved. It came as no surprise that I once again ended up liking most of my Snakku treats. 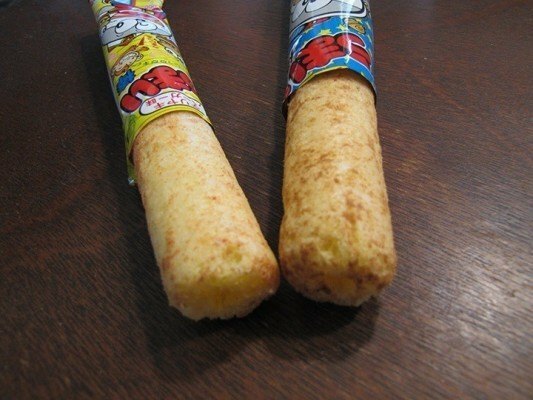 I can totally imagine living in Japan and wanting to run to the corner store to pick-up a few these snacks. Snakku’s founder, Shigeki, has once again both broadened my taste buds’ horizons and imparted interesting knowledge of Japanese culture. 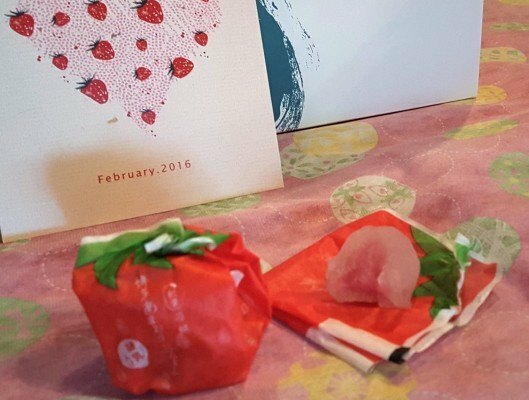 If you’re ready to taste for yourself, Snakku offers 1-month, 3-month and 6-month subscription plans. 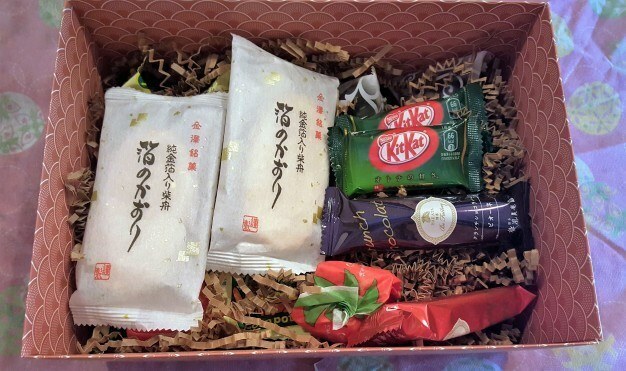 You can even order a tasting box for $15.75, which includes a sampling of 5-7 snacks for those not ready for the culinary commitment of the premium box. It’s a rather awesome deal. And rather tasty, too.